Welcome to our regular column from teacher and stand-up comedian Sarah Whitmore. The holiday season is upon us! In this installment, Sarah asks: “Is the War on Christmas real?” Why not discuss over a slice of heavenly Citrus Solstice Cake? If you are anything like me, you are confused about the supposed War On Christmas. I like to think of myself as the exact kind of lady who believes a person who says, War Has Broken Out! But with this, I just . . . are you joking? I checked in personally with Christmas and guess what? No war. Me: Christmas, are you currently under siege? Do you consider yourself a victim of war—how ‘bout a skirmish? Hostilities of any kind? Christmas: Are you drunk? You have me confused with someone else. Maybe Syria? Myanmar? Instantly stop texting me, forever. Testy? Yes. War ravaged? No. application essay. We must alert ourselves to the fact that our children are not all that remarkable. They, like Christmas, don’t deserve the burden of our unrealistic expectations and fantasies. Take the heat off Xmas by celebrating the Solstice! Put a little pressure on the Sun—like we did in the the good old days. Let Christmas just be one of the holidays. 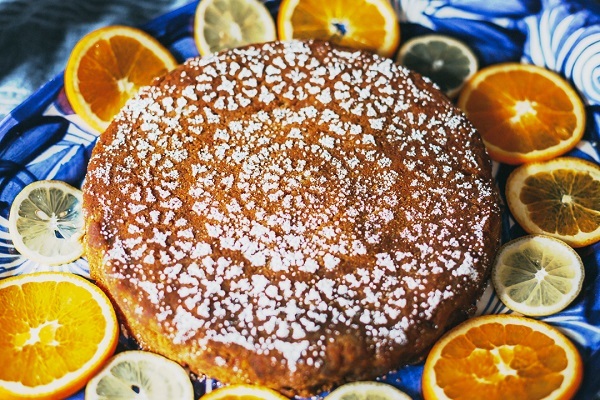 Citrus Solstice Cake is a creamy, yet dairy-free, torte-like love letter to the Mediterranean—made with olive oil, almond flour and bright citrus. Clove and ginger bring a warmth that will remind you, on the darkest day of the year, that tomorrow will be a bit brighter. Summer’s right around the corner. 1. Combine 1 cup honey, 1 cup orange juice, and 2 tsp. vanilla extract in a sauce pan. Simmer on medium until reduced to 1 cup liquid. Possibly a 30-minute task—but trust me, worth every second! 3. Grease a 10 inch round pan—or follow your own path and use whatever pan you like but be sure to adjust time and temperature. 4. Mix dry ingredients together in a medium bowl, including finely minced rosemary. 5. Whisk 1 egg plus 1 egg yolk with ½ cup olive oil in a separate bowl. 6. 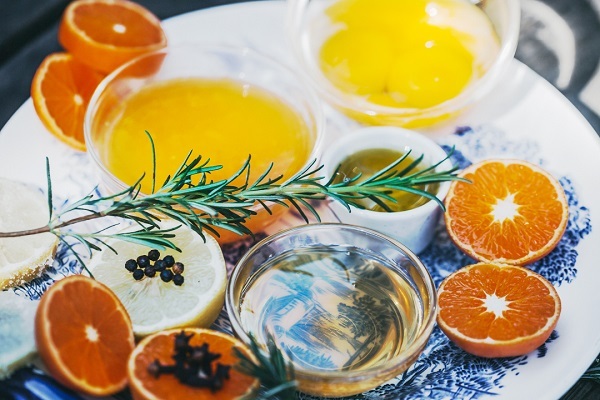 When orange juice and honey mix has been reduced to 1 cup and cooled down a bit, whisk together with the oil, eggs, grated ginger and orange zest. 7. Add wet ingredients to dry. Combine well. 8. Fill pan and bake for 22-26 minutes or until truly brown, like gingerbread. Let cool to set for about 20 minutes. Use a doily or cut out a paper snowflake to make a pretty design on the cake top with powdered sugar. 9. This cake might sink a bit in the center and has a softer set. Since it is mind numbingly delicious, this won’t bother you.